HoooYahhhh! Welcome to the new location of our clinic. 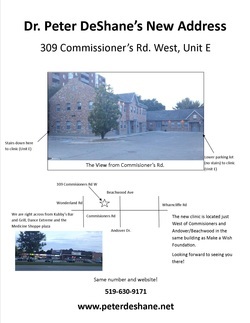 No, it's not the whole building, it's Unit E of 309 Commisioners Rd. West. We are located on the bottom floor on the left side of the building. You can access our clinic from stairs if you park in the upper parking lot or, if stairs are a challenge, park in the bottom parking lot and it's an easy, level walk to our front door! Making appointments will be the same as ever! Just show up at the new location as of October 10th, 2011. Take the stairs on the left, or turn right to the lower parking to find us! Here's our entrance - come on in and be healed! 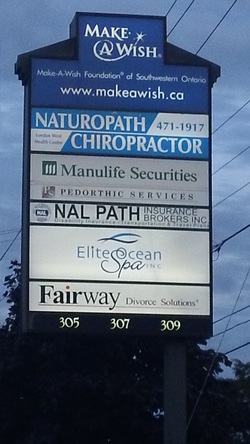 Located Between Wharncliffe Rd and Wonderland Rd.